Ten years ago, in September 2008, plunging home prices pushed Lehman Brothers into bankruptcy, fueling a financial crisis that sent the United States, and much of the world, into a deep recession. 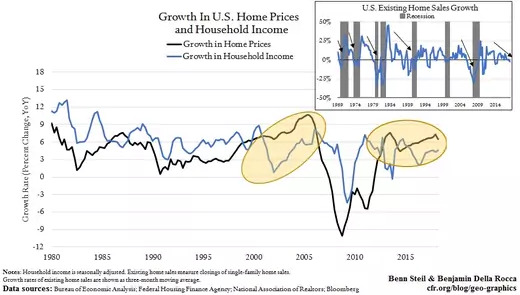 One metric that signaled trouble in the years leading up to the crisis was an expanding gap between the growth in home prices and household income—as shown in the left-hand shaded circle above. When income can’t keep pace with home prices, the latter must come down. Overleveraged home “owners” default on their mortgages, creating a housing glut that drags prices down further. Falling home values slow consumer spending, and therefore GDP growth, by way of the so-called wealth effect—that is, consumers cut spending when their assets fall in value. In the United States, according to one Federal Reserve study, consumption drops by $2.50-5.00 for every $100 decline in housing-market net worth. So when trying to gauge when the current nine-year expansion might come to an end, it is worth keeping an eye on the gap between home prices and income. And as we show in the right-hand shaded circle above, that gap has been substantial, by historical standards, since 2015. Not surprisingly, existing home-sales growth, as shown in the inset chart above, has also fallen steadily since 2015. And a steep drop in such growth has, as the chart shows, preceded every recession since 1970 (save 2001, following the dot-com crash). With the Federal Reserve in tightening mode, and mortgage rates headed up, there is good reason to expect this drop to continue. Assuming it does so on the pace it’s been on since 2015, home-sales growth will fall to levels accompanying prior recessions by the end of 2020—right around election time.